Clubhouse with Bar and Catering facilities. 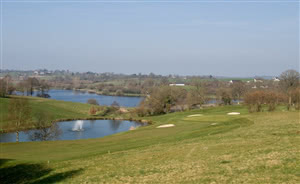 Golf de Vire, originally a 9 hole course but extended to 18 holes in 2008, is set on the edge of the beautiful Lake de Dathee, 4 miles west of Vire in Normandy. The course is a full 18 hole layout which will test even the most accomplisted of golfers with water frequently in play and bunkers guarding the greens.